Action Point (film, 2018). A 2018 American comedy film with "R" rating by Paramount Pictures. Directed by Tim Kirkby. Official Trailer. 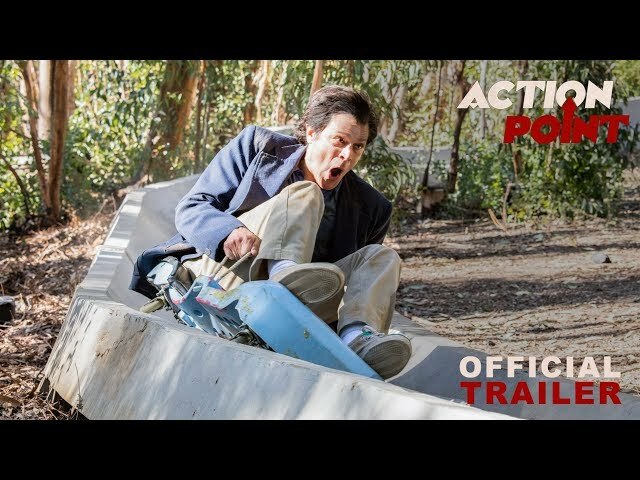 Action Point is a 2018 American comedy film directed by Tim Kirkby. 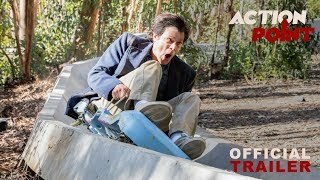 Action Point (2018) - Official Trailer - Paramount Pictures. Deshawn Chico "D.C." Carver (Johnny Knoxville) during a visit from his granddaughter narrates his experiences about when he owned what he refers to as one of the greatest amusement parks of all time. Many years ago, D.C. was the crackpot owner of Action Point, a low-rent, out-of-control amusement park with dangerous rides. Despite the immense danger due to inexperienced and untrained staff, poorly designed rides, and minimal low quality maintenance, the park was popular with kids due to being the only amusement park around. However, during one season, a new amusement park, '7 Parks', with higher safety standards than Action Point opens up and begins to steal its clientele. D.C. is also pressured by his loan officer Knoblach into selling his land due to his failure to pay off a $100,000 loan which will be nearly impossible due to the new competition. Also, his estranged teenage daughter Boogie (Eleanor Worthington Cox) comes to visit and begins to help out at the park as a summer job. One night, D.C. and his staff break into '7 Parks' to observe their competition and sabotage but trip the alarm and are nearly caught. D.C. realizes that he'll need to come up with something big to compete. After his first idea causes him to get blasted down one of his own waterslides, he has an epiphany and realizes that they need to start promoting Action Point as a park about stuff patrons can do, versus 7 Parks being about what they can't do. He decides to take off all safety procedures and brakes on rides in an attempt to make the park stand out, but this causes several people including himself to be horribly injured. Boogie also confesses to Pete that the real reason she's here is to get her dad to sign papers allowing for her mother's boyfriend to become her legal guardian so she can sever ties with her father forever. The film Action Point was scheduled to be released by Paramount Pictures on June 1, 2018 (United States), on August 23, 2018 (Germany) and on August 31, 2018 (United States). The duration of the film is 85 minutes. With a budget of $19 million, the film grossed over $5.1 million. Action Point got low rating from critics. The audience dislikes the film either. Audiences polled by CinemaScore gave the film an average grade of "C+" on a scale ranging from A+ to F.